Mega Man is a saint to legions of fans, martyred because of the sins of an apparently clueless parent company. To fans of Capcom's robotic hero, the lack of a Mega Man game for so many years is proof that the Japanese publisher is evil. The past weekend's announcement of the free, fan-developed Street Fighter x Mega Man seemed to shift opinion a bit, though, and many hope that it will herald a wave of Mega Man love from Capcom. Capcom Announces Street Fighter x Mega Man. Yes, Seriously. And It&apos;s Free. I had the chance to ask some questions of Seo Zong Hui—who's primarily responsible for the fact SFxMM even exists—and Capcom exec Christian Svensson about how the game came about and what the future might hold. Will there be more Blue Bomber in the future? Read on and find out. Kotaku: What was the inspiration for this project? Were you working on it before getting in touch with Capcom? Hui: I really wanted to get into the games industry, but I am currently working on a degree in electrical and electronics engineering. I wanted some practice with game programming, so I decided to make something for practice. I managed to find some images online for Mega Man, and made something from it just for programming practice. At that time, 8-bit pictures were popular so I made some gifs of Street Fighter in the same style to test the response from the community and used Ryu as a test on the game engine I was building on. The results were great and I decided to continue working on it. Many of my friends who tried it were very impressed, and that motivated me as well… having support from friends and fans is something that's very important to developers. In 2010, after a single stage was built, I decided to show it on the Capcom forums and ask for their opinions on the game, and if its allowed at all. Unlike many of the existing game companies, Capcom is very open to fan productions even though there were no job or project offers back in 2010. In 2012, this year, I decided to attend EVO 2012 to talk to Capcom in person. I believe what Bruce Lee said, "if you do not ask, the answer would always be no." Hence, I started approaching every single Capcom staff that I could find. I found Christian Svensson from Capcom, showed him a demo and he liked the idea so I passed him two copies of the game for him to bring back to the company. After I returned to Singapore, about a few weeks later, the project got greenlit and I started working on the game full time. Lastly, I must add that as much as people think that this game was built in a short amount of time, lots of work was done and many considerations were in place over the past few years before the project was officially underway. Kotaku: Were there specific games in the Mega Man and Street Fighter canons that inspired you? Capcom makes a lot of crossover fighting titles. How are you trying to make this one stand apart from games like Tatsunoko Vs. Capcom or Street Fighter x Tekken? Hui: This game, unlike most of the X or VS series, is an action game rather than a fighting game. I wanted to highlight what it would be like if classic Street Fighter characters were to be bosses. Kotaku: What made you choose this particular graphical style for Street Fighter x Mega Man? Hui: This style is something that's popular with Mega Man fans and the fighting game community. It's something more manageable and yet rare and unique these days. There is a lack of classic games that work well today, and I believe that as much as the game development scene is evolving, we should always look to the past and keep some of that essence alive. I hope to be able to do my part and help keep retro games alive today and in future. Kotaku: Which Mega Man character was the hardest to model into fighting game mechanics? Hui: Chun-Li was difficult because she was kind of similar to Ryu, in that I made her based on how she is played in Street Fighter IV as well as some aspects from Street Fighter II. I wanted her to be one of the easier bosses as well, so beginner players would be able to pick up and enjoy the game in some way too. 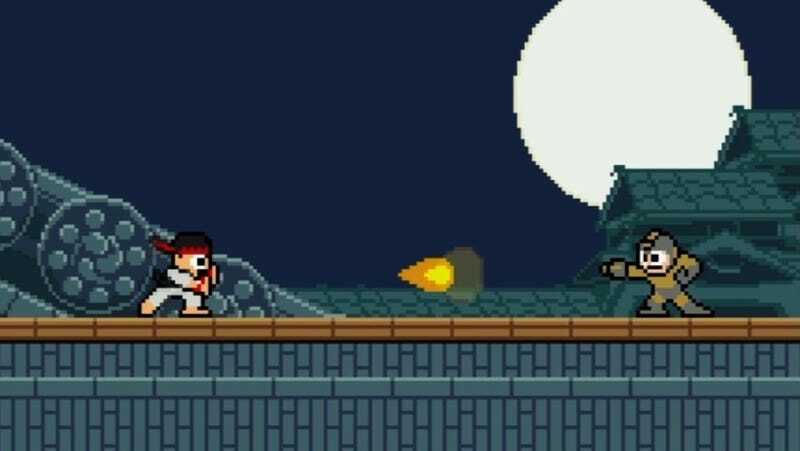 Kotaku: How did you try to recreate the feel of Street Fighters characters in 8-bit form? Hui: First of all, I had to consider all existing moves that the characters have in all games that they have ever appeared in. I then looked through many videos and animations and resized them for reference and sketched them on Paint XP (or something as simple) and tested the animations. If there were no sufficient gimmicks to make them a Mega Man-ish boss, I would research animes and more videos and see if they ever had a suitable move for the game. Finally, they are tested in the game after it is programmed. Kotaku: Is this game something that you expect to satisfy fan craving for new Mega Man games? Svensson: As a Mega Man fan, I'd hope that it's something that scratches one type of itch. A new game, with new mechanics, bosses and weapons is a great thing. Free is even better. That said, it is not meant to be the cure for all that ails Mega Man fans. For that to happen, I know we need something more. Kotaku: What if it doesn't whet fans' appetite? What are Capcom's plans for a standalone Mega Man game? Svensson: Alas, on that front, I'll need to keep you in suspense. We're still having many conversations about the future of the franchise and I hope to have more news to share at some point during the 25th Anniversary celebrations in 2013. Kotaku: Why release the game for free? Svensson: Two reasons, really. First, we want to continue to expose as many people as possible to the awesomeness that is Mega Man. Being free extends reach not just to fans, but it can hopefully create new fans for us as well. Second, we haven't had enough Mega Man in recent years. We know fans are anxious for new games and while we could have charged for this, we felt it would do more good with the fan base to just make this game a gift. Call it an early Christmas present! Kotaku: Is Capcom open to other fan-created projects like this? Does SF vs MM have to perform to certain expectations to make future fan games happen? Svensson: Honestly, I'm not sure. This was an exceptional fan effort that we engaged with early in development. From a concept standpoint, the marriage of two key franchises that were both to be celebrating 25th anniversaries is a rare occurrence. Is this something we could see ourselves getting more involved with in the future? Maybe. Fans are passionate and amazingly talented and I don't want to close the door on that possibility, but at the same time, we aren't likely to be soliciting folks to submit concepts on a regular basis.